Hi, I’m Landee from Landeelu.com and I am so excited to be here for Jen’s Happy Holidays Event! So much inspiration for making this holiday season special for you and those you love! Today I want to share with you a fun project that will help you preserve those memories you are making each year and put them on display. Christmas is so much about spending time with family and making memories. Well, that and eating so much sugar and refined flour it should be illegal. It’s also a time where lots of photos are taken but sometimes those photos don’t get out and get displayed year after year. I have been thinking that I would like to make some kind of a Christmas Memories banner or something for a while but then I got the idea to make some ornaments instead! The kids always help with the tree and it’s always amazing how so many of the Christmas ornaments have a special memory attached to them. Why not make some with some Christmas photos? 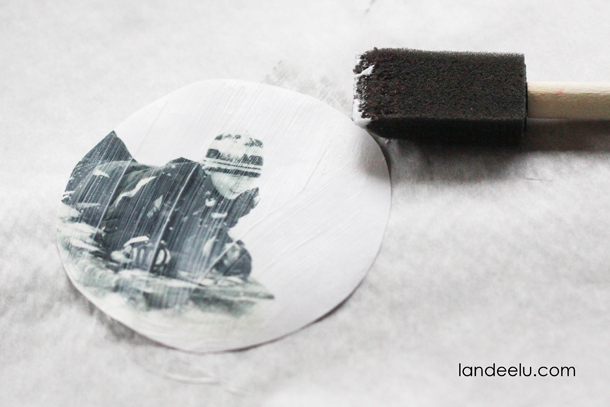 I have also been dying to try out this photo transfer technique that I heard about a couple of years ago and this was the perfect project! 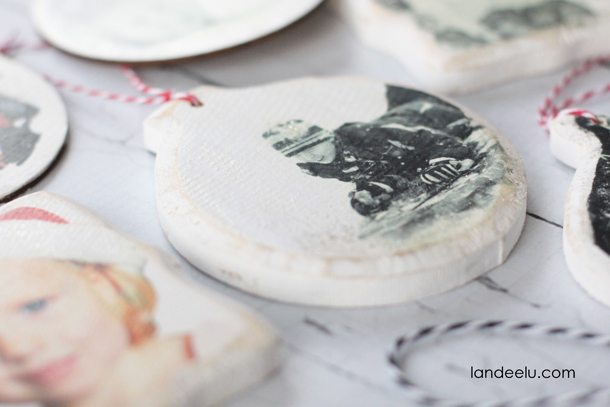 It’s so much cooler than just mod podging a photo on (although I do love me some mod podge, no doubt on that). The image is actually TRANSFERED onto the wood. I love the look! 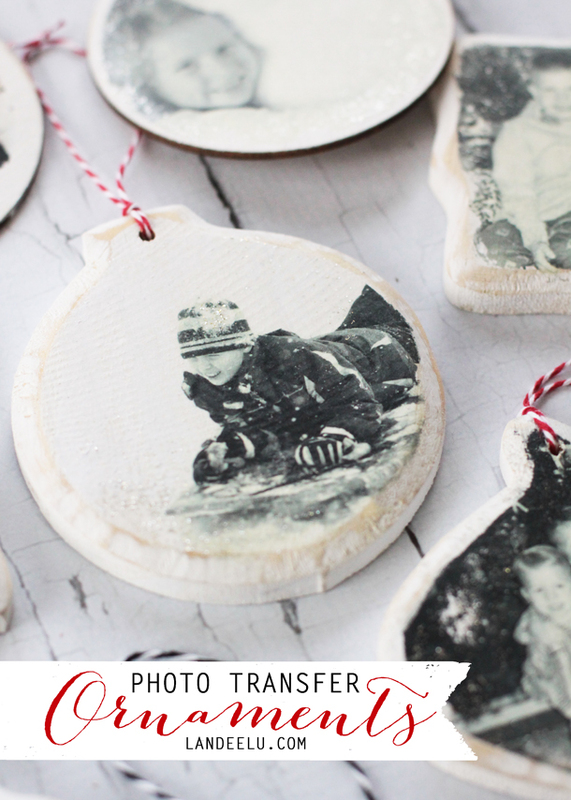 Christmas images you’ve had printed on a LASER printer (ink jet will not work. Kinko’s self serve printers are laser. Just put all your images onto a paper sized image in your photo editing software, put on a memory stick, and take stick to Kinko’s… the self serve machines are easy! They are 59 cents each to print). If you have wording or care about having the image a certain way, make sure you IMAGE FLIP the photos first. 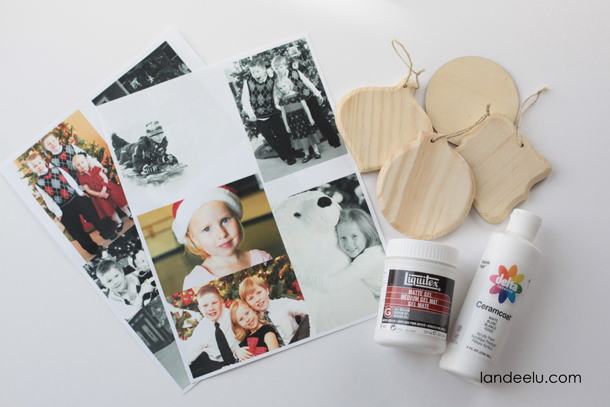 STEP ONE: Paint your wood ornaments with your white craft paint (a lighter background is best to trasfer the photo). I distressed the edges with sandpaper. Totally optional but I love that look! STEP FIVE: Sand around edges again, if you want. Apply glitter paint to anywhere you’d like! I put it where there was snow, or there was a Christmas tree in the background, or on the plate of sprinkle cookies my son is holding in one (hard to see in these photos though). Get creative! Add twine to hang and you’re done! I love this technique because it makes the image PART of your ornament rather than just attached to it. You can see the wood grain texture through the image and it looks so cool! I also am glad I tried it with both black and white and color images. Black and white is more “vintage” looking but I love the look of the color as well! Here’s another great idea for gifts this year, use her cute Merry & Bright Printables to make this fun gift for neighbors and friends! And if you’re looking for a great way to use up that Halloween Candy, start this Countdown to Christmas Chain idea with your kids. So fun! And, I love this idea of dressing up your chairs for Christmas with this Christmas Chair Wreath idea! So fun! 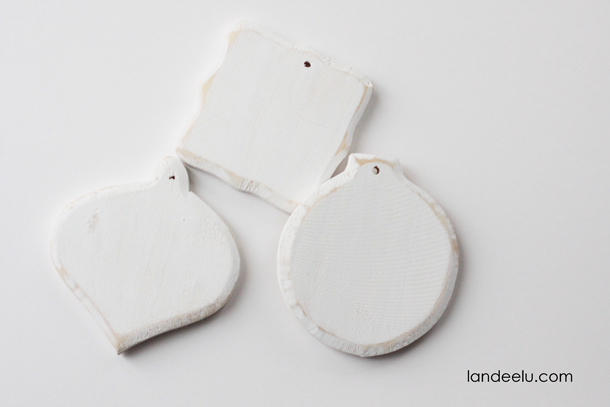 For another easy ornament idea, check out these Printable Geormetic Ornaments from Today’s Creative Blog! Did you seal with any product? Did you deal with any product? Practice simple recipes at first to get used to the difference in heat. I am trying to find out if the picture was on photo paper or normal plain white paper? Also is this the Gel Medium you used ? Liquitex Professional Matte Gel Medium? I googled Gel Medium and this is what came up. Does anyone know what kind of paper was used? Confused if it’s photo or actual paper. Thanks for any info! Thanks for this great idea! 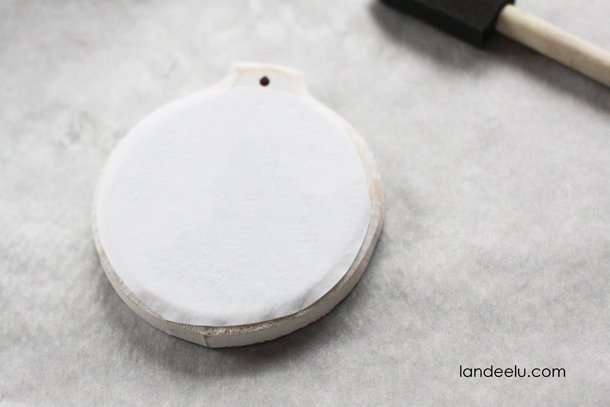 I’m wondering if the white paint has to dry first, before applying the gel medium? Or can it still be wet from the paint? Thank you! Can original picture be used – or does picture have to be printed on paper? PLEASE ADVISE as I’d like to try this for gifts. Thanks. Did you use plain paper? I love these so much! 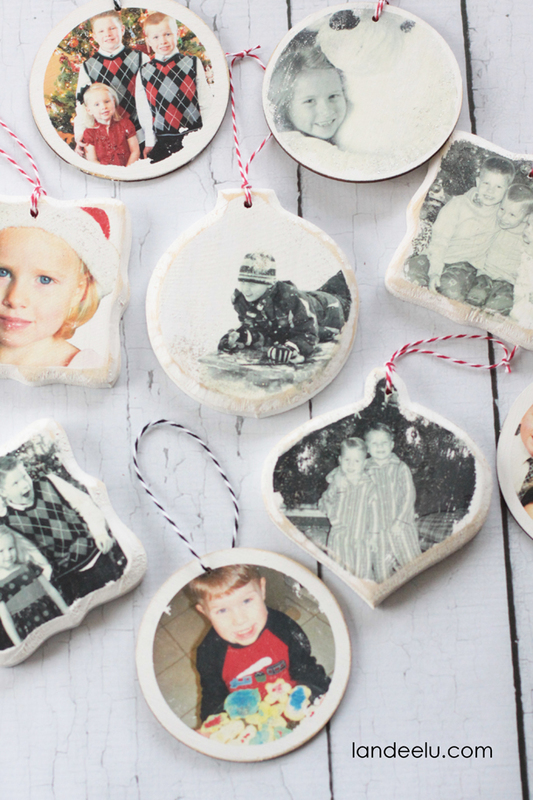 I wanted to give a special gift this year to my extended family – and this is just perfect! I just took out all the old family photos and my only problem is that there are too many pictures to choose! thank you for breaking it down so easily! i will be making these for gifts! 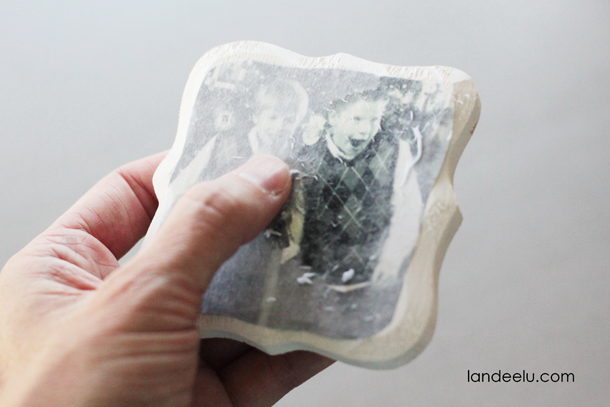 Another fun way is to use a flat wood burning tool to melt the toner to the wood! i love these, but was not good at not rubbing off the picture.